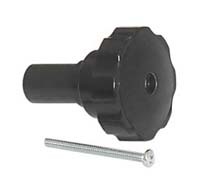 One of the common problems with Beseler Printmaker and 67 series enlargers, particularly in schools where the enlargers get frequent use, is the plastic focus knob. With heavy use, the standard knob frequently wears or splits so that the knob just spins loosely on the shaft, resulting in an enlarger that can't be focused. Our heavy-duty replacement knob is specifically designed to address those problems. It's a much sturdier knob with a custom metal insert. Once tightened on the shaft, it's a snug fit that won't split or wear out, and should never need to be replaced. Fits Printmaker 35, Printmaker 67, 67CP, and all other Beseler 67 series enlargers. Replaces Beseler part # 10-45933. Supplied with securing screw. A matching elevation lock knob for Printmaker series enlargers is also available.